The No. 19-ranked Gators started off with a bang, blowing out the Warner Southern Royals 108-49 in an exhibition game on Monday at the O'Connell Center. This photo gallery provides a sample of what Gator Country subscribers can expect this season -- unmatched coverage of the Florida basketball team that will include game stories, previews, profiles, photo galleries and video highlights. Four freshman made their debut, lighting up the scoreboard with 37 points and providing a glimpse of what's to come in 2008-2009. Florida is now 54-13-1 all-time in exhibition play and 29-2-1 under head coach Billy Donovan. The Gators allowed only two baskets during the first 10 minutes of the game. Dan Werner led the team with 17 points. Freshman Erving Walker led his classmates with 13 points. Nick Calathes led the Gators with nine assists. 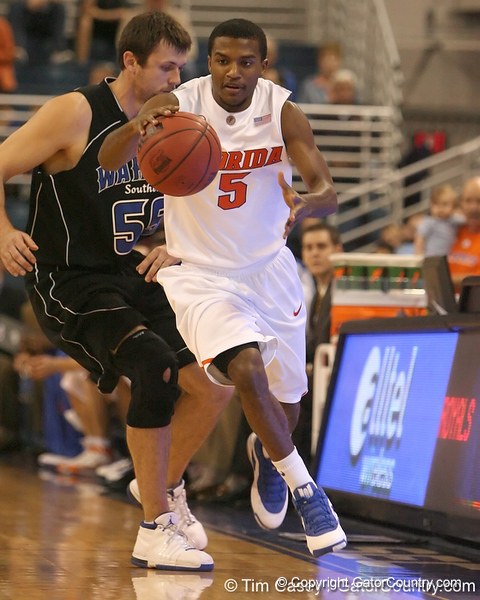 Florida sophomore guard Jai Lucas attempts a steal during the first half of the Gators' exhibition game against the Warner Southern Royals on Monday, November 3, 2008 at the Stephen C. O'Connell Center in Gainesville, Fla.